Miracle Springs is the unique place where business, traditional values and hospitality are merged. Comfortable, business-like with soft artistic touch makes strong impression on all Guests. Inviting you to enjoy its spectacular mountain and desert scenery, newly-decorated rooms and suites, full-service spa, wonderful restaurant, banquet facilities, gift shop, spa boutique and pristine natural hot mineral water pools. Three Diamond rated by AAA, Miracle Springs Resort and Spa is only minutes from Palm Springs Airport and downtown Palm Springs. 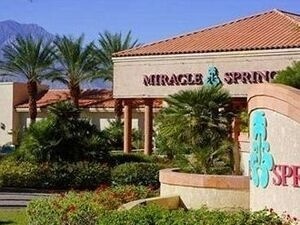 Totally refurbished in 2008, Miracle Springs’ 110 large, luxurious rooms are now more beautiful than ever.